Sprouts have become a regular part of our diet, for a few years now. These are the sprouts that I have been using presently. Many whole millets/grams can be sprouted and made into healthy alternatives to snacks and meals. 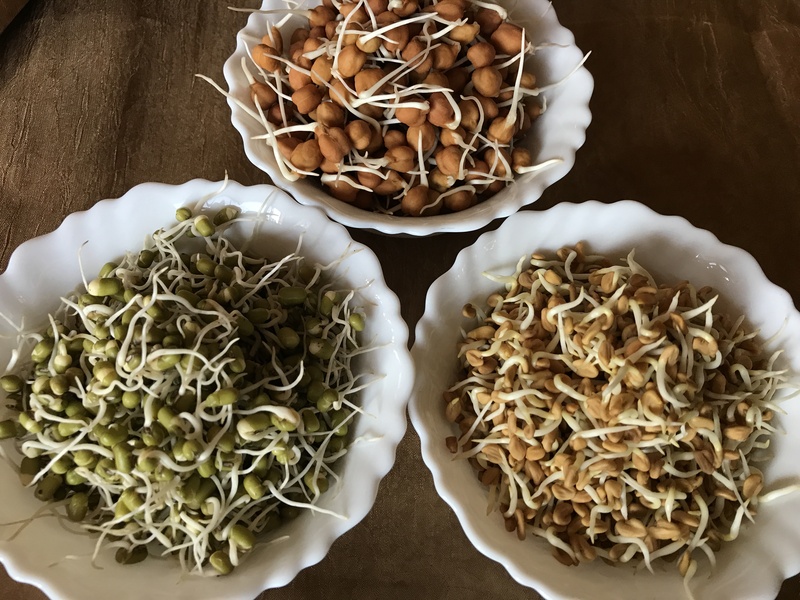 Before we move on to the benefits and usages of sprouts, my Sprouts Story is something to be shared. 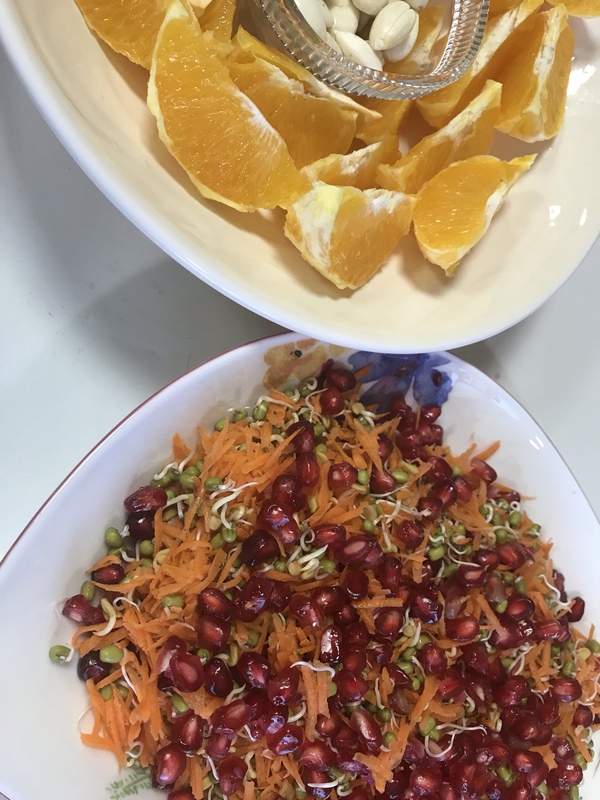 Initially, the inclusion of sprouts started as a salad for breakfast. It was great, light, refreshing and tasty.. They were accompaniments to a light breakfast. Only on a few weekends, we would start the day with sprouts alone to break the fast. After a few years, there was a change in breakfast. I converted to dosais or idlis with whole grains, millets or unpolished rice varieties. Hence, sprouts were shifted to be part of the lunch platter. Fresh salad with carrots, cucumber or any salad veggies with liberal juice of lemon, went with lunch. Here, there arose a problem. While packing lunch in the morning, the freshness of the sprouts was lost. I moved it further evening as a replacement for tea/coffee. Now, I couldn’t survive without my coffee. If coffee was consumed with a healthy stuff, I believe the goodness of the healthy food is eaten up by caffeine in coffee and tea. Tell me I’m wrong, and I shall include my lonely coffee with breakfast, lunch and dinner too. Coming back to sprouts, I switched it over to evening.. as a snack during tea. Then, winter set in. The fresh sprouts wouldn’t go well raw, cold with fresh veggies- I wanted something hot for the chilly weather. Additionally, the sprouted black gram was posing problems to chew . I thought of cooking or braising it to make it softer. While we had elders as guests, it made a lighter healthier snack while cooked… Easy to munch and tastier with South Indian seasoning- mustard seeds, curry leaves and chillies. A great snack for a cold winter evening. I have to mention here, I had my coffee after sufficient time gap. 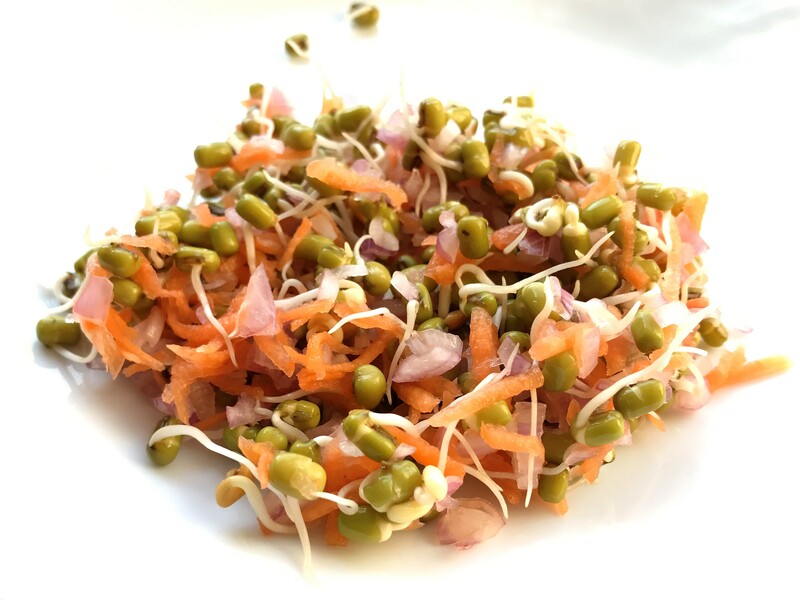 Beyond the health benefits, sprouts are a beauty to watch grow. They mark the beginning of growth or existence. 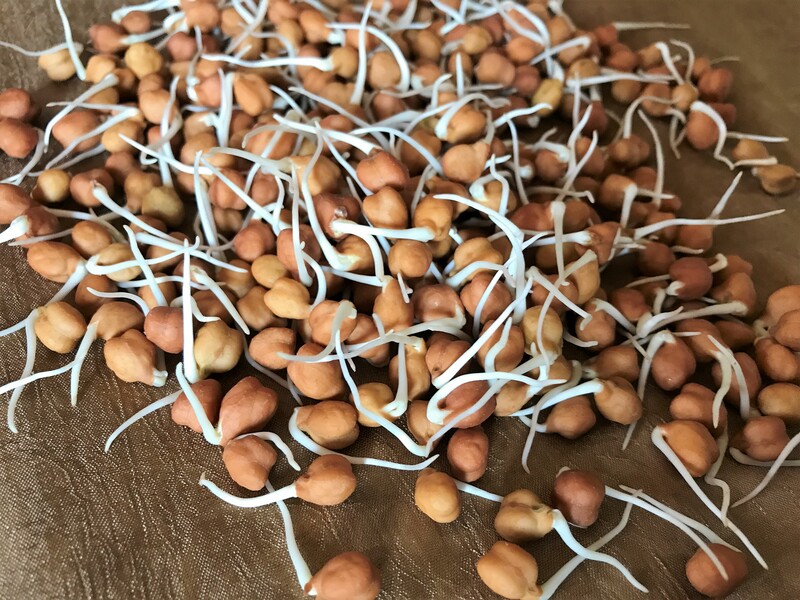 One can truly see the glow of new life in the sprouted seeds. If you feel I am excessively exaggerating, please try for yourself. 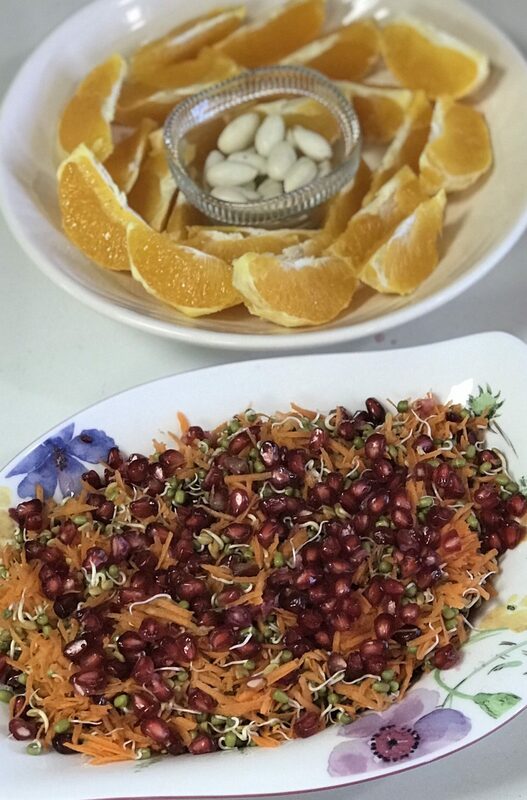 There are different ways to sprout seeds. This is what I do. Soak seeds overnight. Drain water. Pat dry with a clean kitchen towel. Place in a clean dry box and close with a damp cheese cloth. Shake every now and then. Be careful, if there is too much water in the seeds, they would attract fungal growth. If they are too dry, they wouldn’t sprout. It might take a few times to understand the process and succeed. 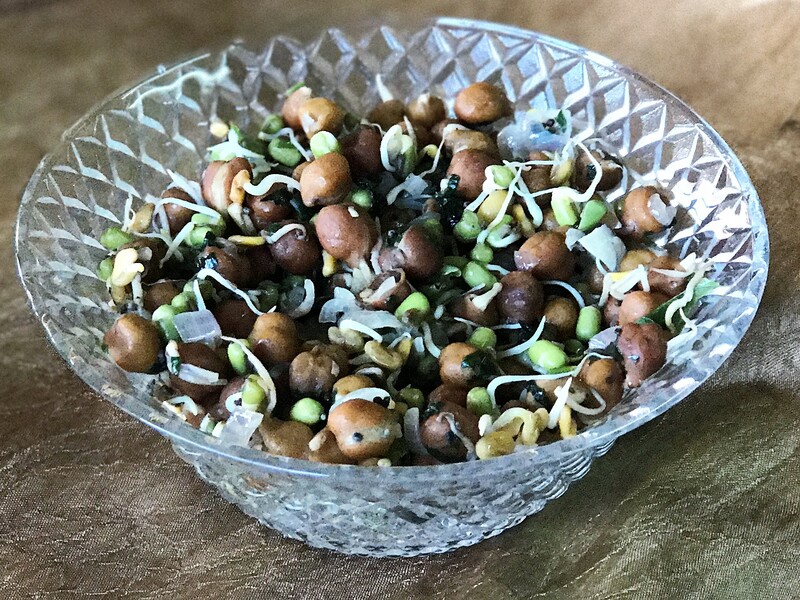 Note: Green gram sprouts quickly. Fenugreek is a bit sticky. Black gram poses greater problems… It attracts fungus very easily. But be patient… Do not lose hope.. Slow comprehension of the process of each seed would help flawless sprouting, even after a few failures. Pre-digested foods refer to the foods that have been pre-digested for us either by another animal or machines or equipment. The nutrients are in pre-digested form, so they require very little digestion, and the nutrients are easily absorbed into the bloodstream. Thus, an elemental diet provides you nutritional needs while giving your digestive system at rest. 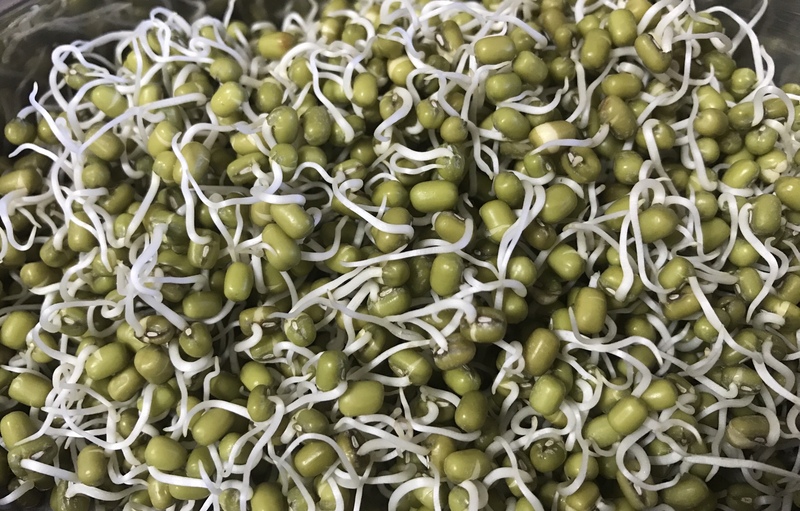 Sprouts nutrition reduces high blood pressure, helps in weight loss, lowers cardiovascular risk and helps us to fight against diabetes and fatty liver. To know more about benefits of sprouts, google has loads of information. 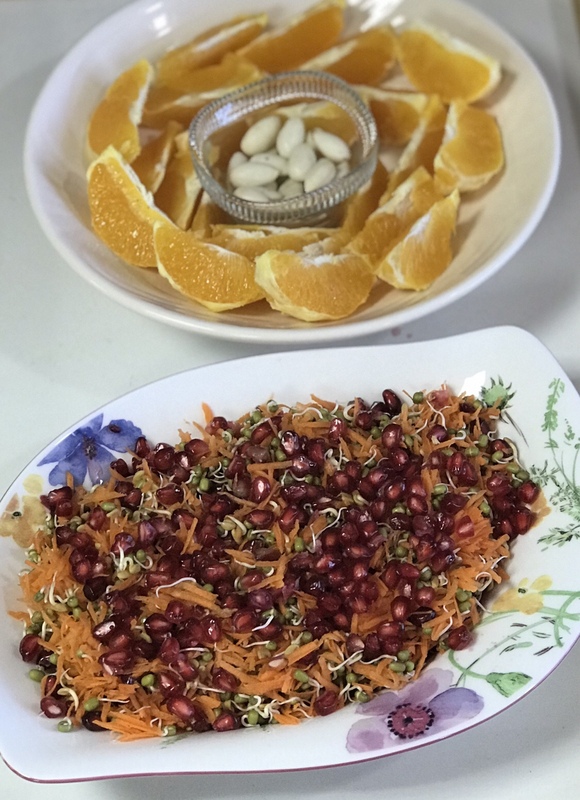 These salads are vey flexible, one can alter all ingredients as per preference. These are only a few suggestions. Usage is purely one’s own imagination or innovation. Mix all together and season if needed with salt, pepper and lemon. This tastes awesome without any seasoning too. Mix all together and season with salt, pepper and lemon. 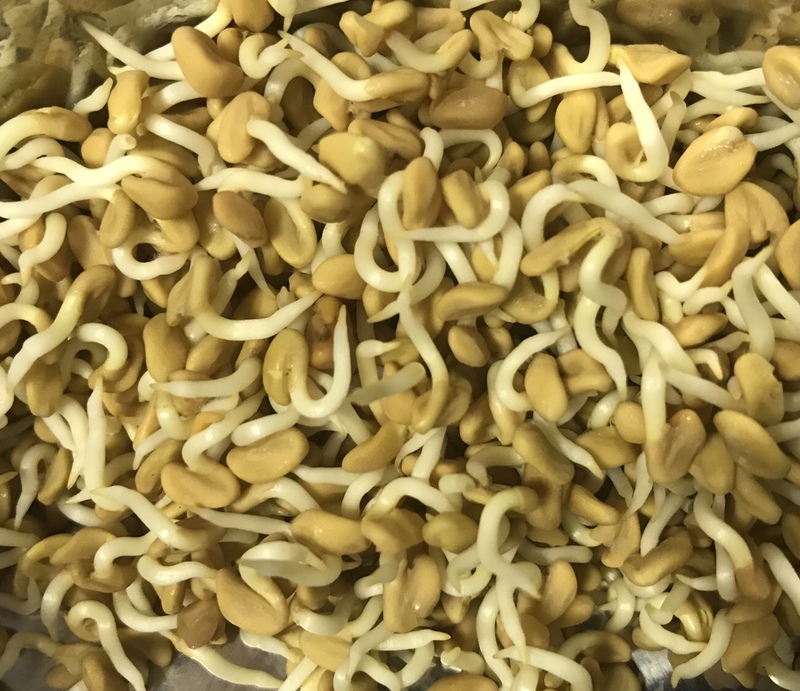 Sprouts Sundal is ready to be served.